Time was when one used to ask for an apple one would get a piece of fruit, these day’s one might just as likely get a box of completely inedible micro chips. Back then if one asked for a mini one would either get a short skirt or an extremely small car which drivers over 6 feet tall might have to drive with their knees around their ears, nowadays with the right financial credentials one might just as likely get a Hummer like 6 foot tall Dakar Rally leviathan known as the Mini Cooper Countryman ALL4 Racing. 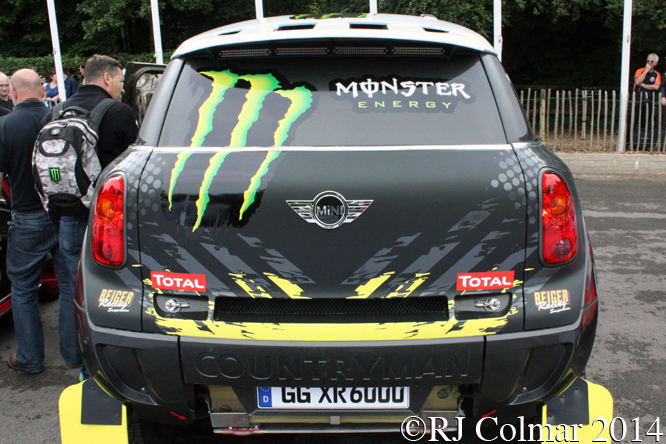 Apart from a vague likeness to the overall shape of the Mini Cooper Countryman street car developed by BMW and Mini John Cooper Works WRC rally car developed by Prodrive, the Mini Cooper Countryman ALL4 Racing has little in common with it’s street or competition siblings aside from the badges, door handles, windscreen and lights that decorate the carbon fibre body. The chassis for the T1.2 class Rally Raid All 4 Racing is a steel frame designed and constructed by Heggemann Autosport GmbH in Büren not far from Paderborn / Lippstadt Airport in Germany. The double wishbone suspension with twin titanium shock absorbers on each corner has 8 inches / 203 mm of travel and the wheels can be changed in three mins with the aid of the on board jacking system. The T1.2 Rally Raid class is for all wheel drive vehicles powered by diesel motors which in this application takes the form of a 3 litre / 183 cui twin turbocharged 6 cylinder dry sumped motor built for BMW Motoren GmbH by Magna Steyr in in Oberwaltersdorf, Austria, that when fitted with the mandatory 38mm / 1.49 inch air restrictor produces just over 300hp, the roof scoop is for the intercooler fitted behind the drivers compartment. With a six speed sequential gearbox the All4 racing, that weighs a hefty 2.5 tonnes when fully kitted out with; 400 litres / 89 gallons Imp / 105 gal US, three spare tyres, spare drive shaft kept in a compartment below the floor and everything else mandated for survival and safety, can reach 60mph from rest in six seconds and a top speed of 110mph off road. The whole car is put together and run by the X-Raid Team based in Trebur-Astheim Germany that is owned by Sven Quandt, a member of the family that has the majority stake holding of BMW shares. 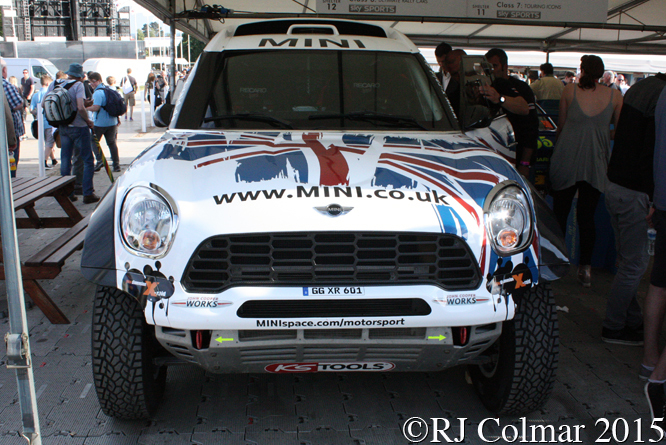 The team first ran it’s Mini Cooper Countryman ALL4 Racing cars that eventually replaced it’s BMW X3 CC Rally Raid vehicles, in 2011 winning the Abu Dhabi Desert Challenge with Stephane Peterhansel and Baja Portalegre 500 with Filipe Campos. The following year Stéphane Peterhansel and France Jean-Paul Cottret led home team mates Nani Roma and Michel Périn to win the Dakar Rally with Stéphane going on to win the Baja Spain round of the FIA World Cup Cross Country Rally championship. In 2013 Stéphane won his sixth Dakar Rally driving a car matching the six times he won it on a motorcycle, again with Jean-Paul in the co drivers seat of the winning All4 Racing. Spaniard Joan “Nani” Roma Cararach (Nani Roma) partnered by Frenchman Michel managed to pip the 2012 / 2013 winners the following year when Qatari Nasser Al-Attiyah and Spaniard Lucas Cruz made it an All4 Racing lock out on the podium. In 2015 2011 winner Nasser now partnered by Matthieu Baumel steered their All4 Racing to victory on the Dakar. The models 4 year reign of dominance on the Dakar was brought to an end by Peugeot with Nasser and Matthieu bringing their All 4 Racing in 2nd behind their former team mates Stéphane and Jean-Paul. 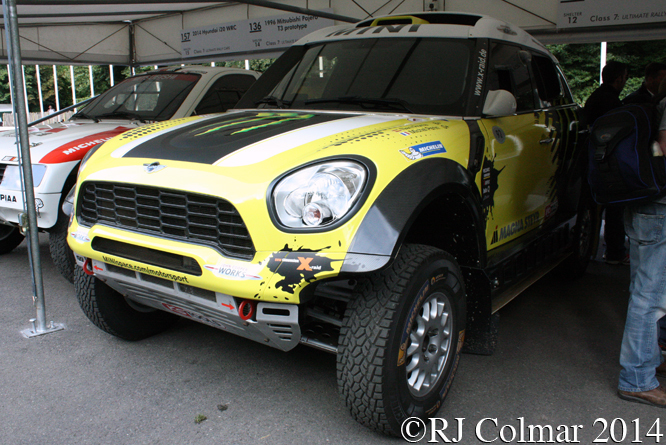 In amazing show of strength in depth and reliability in 2013 11 Mini Cooper Countryman All4 Racings, reckoned to cost around € 1 million / US$ 1.4 million each, were entered in the Dakar Rally and all 11 finished inside the top 20. 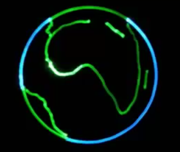 Thanks for joining me on this “US Dollars One Million Four Hundred Thousand” edition of “Gettin’ a li’l psycho on tyres” I hope you will join me again for Mercedes Monday tomorrow. Don’t forget to come back now ! 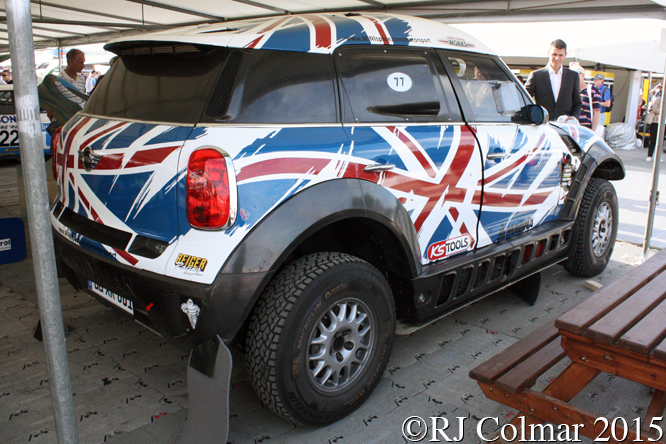 This entry was posted in Uncategorized and tagged Al-Attiyah, All4, Baumel, BMW, Campos, Colmar, Cooper, Cottret, Countryman, Cruz, Festival, Goodwood, Heggeman, Magna, Mini, of, Périn, Peterhansel, Psychoontyres, Quandt, Racing, Ralph, Roma, Speed, Steyer, X-Raid on January 24, 2016 by Ralph.